This weekend has been great! It went by waaaaaaay too fast, as weekends usually tend to. It wasn’t that I did anything particularly amazing, but the weather was simply gorgeous. I don’t think I shut my windows once. I finally got a St. Louis library card and did a lot of reading. I bought hydrangeas. 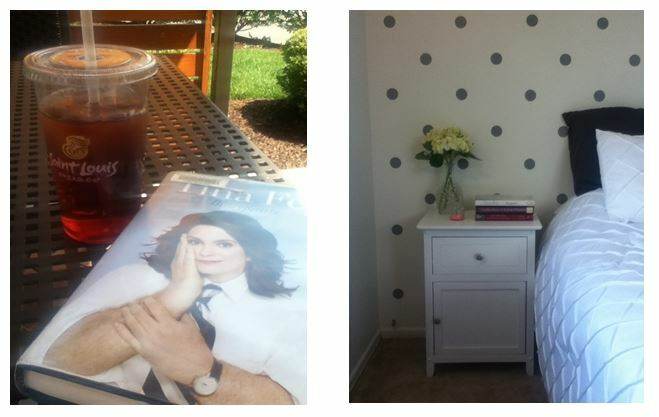 I started putting up a polka dot wall in my bedroom. I put together new nightstands for my bedroom. I spent time just drinking sweet tea outside. What a relaxing weekend! Another thing I did this weekend was finish up a batch of chili that I made during the week. No joke, I think this is my favorite new recipe. It is amazing. It is easy. It is made in the crockpot. It is delicious. What more could you want?!? I originally found the recipe on Pinterest, but you can find the original recipe here. I did do a few things differently: I didn’t use frozen chicken, mine was raw. Still came out great. She also suggests serving the chili over rice, but I didn’t have any rice on hand and didn’t feel like going to the store. What I did have in my cupboard was quinoa, so that is what I used! I cooked up a cup of quinoa and mixed it in with the finished chili and whoa was that a good choice! That also stretched out the serving size from the suggested 4 to about 6-8. 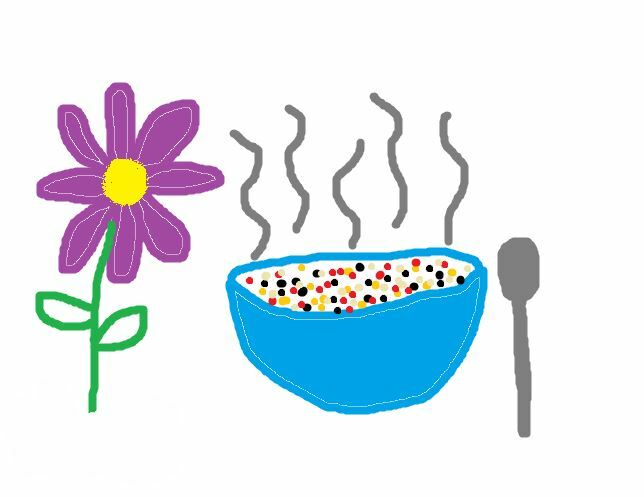 I ate this up so quickly that I didn’t have time to take a picture, so I made a very life-like and accurate drawing of what the chili looked like. You should also know that the flower isn’t part of the meal, it is just there to be purple and pretty. I hope you all had a wonderful weekend as well! I am off to go prep my meals and iron my clothes for the week in an attempt to be prepared and not panic at 5:15 tomorrow morning because I don’t know what to bring for lunch and all my clothes are wrinkly. Happy Sunday!